Meet the Palmers | PALMER PROPERTIES OF VIRGINIA LLC (434)575-2417 - We specialize in RESIDENTIAL, FARMS, BUILDING LOTS, ACREAGE AND COMMERCIAL properties in SOUTH BOSTON/HALIFAX COUNTY, CLARKSVILLE/MECKLENBURG COUNTY, DANVILLE AND SURROUNDING AREAS. 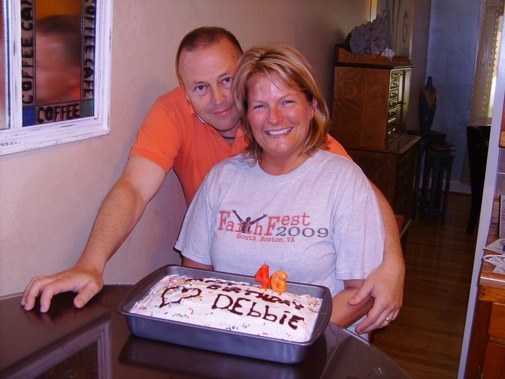 Debbie and Lucky Palmer South Boston's husband and wife team opened Palmer Properties of VA in April of 2006. Both have been top producing agents for Halifax County for more than a combined 40 years. They quickly expanded Palmer Properties to include more agents to their firm and have become one of Halifax Counties most succussful and respected real estate firms. The Palmer family resides on a small farm in Nathalie where they enjoy gardening and having plenty of room to roam for their beloved dogs. Debbie Palmer is a member of the Halifax Coounty Dog Squad and is passionate about helping with rescue and fostering. They have three sons, Bradley who is 30, Cody 22 and their oldest son Gary who is 35. The couple relocated to South Boston from Roanoke VA and decided to put down roots and raise their family in South Boston. Debbie and Lucky are active business leaders in the community and have dedicated theirselves to the real estate profession. Both are experts in the field with extensive experience in residential, commercial and farm sales.
" We love what we do for a living," quoted Debbie, "I can't imagine doing anything else." For professional top notch service call Debbie or Lucky for all your real estate needs.